Gain strong skills in French language and a critical insight into Francophone literatures and cultures within a global context. Why study French at UBC’s Okanagan campus? Language students at UBC Okanagan have the invaluable opportunity to study abroad in a French-speaking university for one or two semesters through UBC’s Go Global exchange program. There are opportunities for you to work with faculty as teaching assistants, markers or research assistants. Proficiency or mastery of the French language will considerably expand your career options and destinations. Studies have shown that professionals with various levels of bilingualism make more money and are more marketable. Careers include tourism, management, business, media, education, as well as civil and foreign services. In our French program, you will explore a diversity of francophone cultures from around the world. Students are encouraged to broaden their cultural awareness by engaging with the local Francophone community, as well as exchange programs such as the federal government’s Explore program, UBC’s Go Global international study abroad program, and the Language Assistant Program offered in partnership with the French Government. There is a great need of qualified and dynamic French teachers in BC. After obtaining your BA with a major in French, you can apply to the 16-month Bachelor of Education program to complete a teaching degree. You can specialize in teaching French as a second language (French Immersion, Core French) or French as a first language (in a Francophone school). The study of French can be an excellent focus for your degree or a perfect complement to a program of study. French is one of the two official Canadian languages and the only language other than English spoken on five continents. Study in French can be applied to many fields and can facilitate work in nearly every region of the globe. Pursue a Bachelor of Arts (BA)—with a major, combined major, or minor—in our French language and literature program at UBC Okanagan. The BA program includes language studies at the beginner, intermediate and advanced levels, as well as courses in literature, culture and translation. The language courses are designed to improve skills in reading, composition and oral communication, and foster critical analysis of cultural material as well as intercultural understanding. Our literature courses cover francophone literatures across historical periods and from a range of geographical regions. 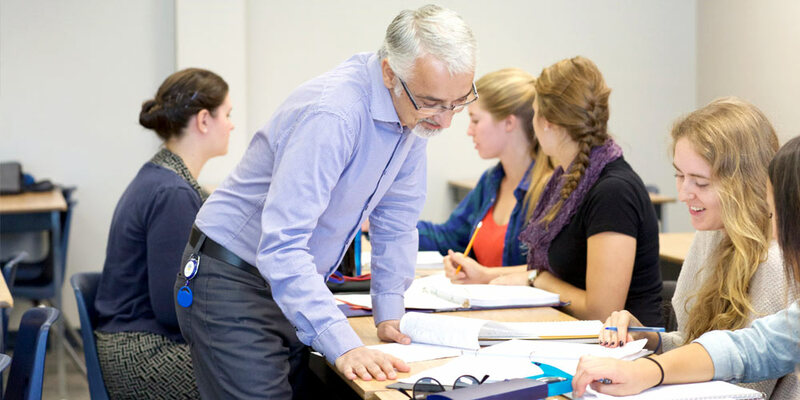 UBC Okanagan’s French program offers a wide variety of foundational and advanced courses that cover translation, literature and culture. Browse here for all French courses and descriptions. French undergraduates can complete a BA in French with a Major, Minor, or General Studies BA with a concentration in French, or a BA in French and Spanish. Teach French! There is a great need of qualified and dynamic French teachers in BC. After obtaining your BA with a major in French, you can apply to the 16-month Bachelor of Education program to complete a teaching degree. You can specialize in teaching French as a second language (French Immersion, Core French) or French as a first language (in a Francophone school). Students are encouraged to declare their major in French at the end of their first year in order to take the prerequisite second-year courses. Refer to the Academic Calendar for required courses. Study in French can be applied to nearly any field and can facilitate work in nearly every region of the globe. Earn a UBC degree respected by employers around the globe, and secure a career as a bilingual educator, community worker development agency worker, or translator. Or continue your education to work in professions such as law, teaching, and international relations. Find out what students, faculty, and alumni have to say about the UBC’s Okanagan campus: ourstories.ok.ubc.ca. Follow our French program on Facebook to keep up to date on happenings on campus.